Please refer to the photo below in the unlikely event you will need replacement parts or requesting help with use of your sun visors. A printable Parts Order Form can be obtained by clicking this link: PartsOrder. As you will notice we have taken a different approach for setting the cost for parts. 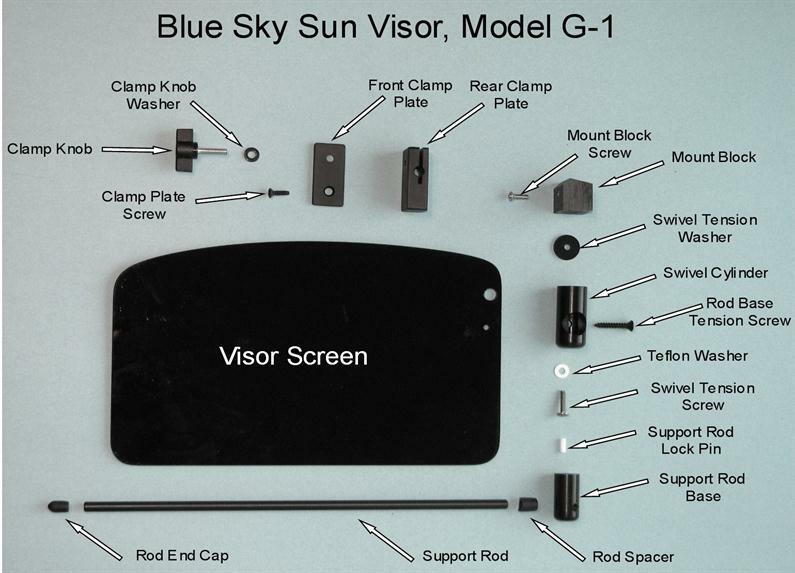 If you add up the cost of each of the parts for a complete sun visor, it will be only slightly more than our normal sales price. We reject the idea that individual parts should cost many times more than what they cost as a component of the finished product. Parts may be ordered as single items or assemblies at the prices shown below. "Beat the Heat, Haze, Glare and Fatigue"
If you wish to order parts, please provide us with a phone number or an e-mail address so that we can get your billing information and give you the Total Order cost with shipping charges prior to sending your order.